-19 here last night! That did it. We measured 5” of ice in the area we have measured previously. About 20’ from where we where testing we found a small open hole, caused by a piece of dead weed absorbing the solar heat. It was about 10” wide on the surface and 3” open at the bottom of the ice. 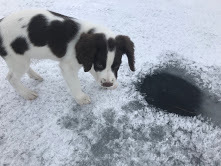 Always watch out for these wet, potentially soft spots when on the ice! The ice out front is now safe for foot traffic, but we don’t know about the middle of the lake. Best fishing this time of year is in the shallows, so no real reason to be out in the middle of the lake. 5″ of ice in front of the resort! An open spot, watch out for these!